The Greenwich Art Society proudly presents its 102nd Annual Members Exhibition, a major exhibition comprised of artwork by Greenwich Art Society members. The show takes place at The Bendheim Gallery on the 2nd floor at Greenwich Art Center from March 8, 2019 thru April 4, 2019. Opening reception March 15th from 6 – 8 PM. There will be a public reception on Friday, March 15 from 6:00pm-8pm with a special VIP walk and talk tour with the juror on Thursday, March 21 from 5:30-7:00. The Greenwich Art Center / Bendheim Gallery is located at 299 Greenwich Ave., Greenwich, CT 06830. The Greenwich Art Society 102nd Annual Members Exhibition will exhibit a diverse range of works by its members and will be juried by a curator from one of the major NYC museums. The Annual Members Exhibition is highly competitive, drawing fine artists from the entire tristate region. Many of the Society’s artists/members are locally and regionally recognized for their work and have shown in galleries and art fairs in NYC and beyond. 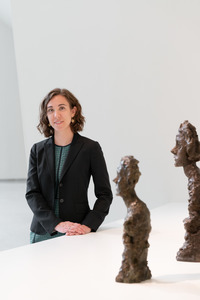 Megan Fontanella is Curator, Modern Art and Provenance at the Solomon R. Guggenheim Museum, New York. Since joining the institution in 2005, Megan has curated or co-organized nearly thirty exhibitions for the Guggenheim’s extended constellation of museums in Berlin, Bilbao, New York, and Venice, as well as developed shows for the traveling exhibitions program. Megan’s collection-based exhibitions have included Visionaries: Creating a Modern Guggenheim (2017); Art of Another Kind: International Abstraction and the Guggenheim, 1949–1960(2012); and The Great Upheaval: Modern Art from the Guggenheim Collection, 1910–1918 (2011), among others. She also curated Visions of Modernity(2012-13), the final presentation of the Deutsche Guggenheim, Berlin. More recently, Megan co-curated Giacometti(2018) and supported Alberto Burri: The Trauma of Painting (2015-16), as well as Robert Motherwell: Early Collages (2013). Her current project is Van Gogh to Picasso: The Thannhauser Legacy (2018-20), an exhibition that will travel to Spain, France, and Italy. Megan likewise maintains the Guggenheim’s Thannhauser Gallery, a permanent display of 19th- and early 20th-century art. Apart from her exhibitions activities, Megan conducts provenance research for the Guggenheim and collaborates on cross-departmental initiatives related to collections stewardship. Megan received her B.A. in Art History modified with History from Dartmouth College and went on to receive her M.A. in Art History from the Courtauld Institute of Art, London, where she specialized in late 19th-century French art.